HAVE A HARRY POTTER HOLIDAY! The Tales of Beedle the Bard features five classic-wizarding tales written and illustrated by J.K. Rowling. A must have for every Harry Potter Fan! Available December 4, 2008! 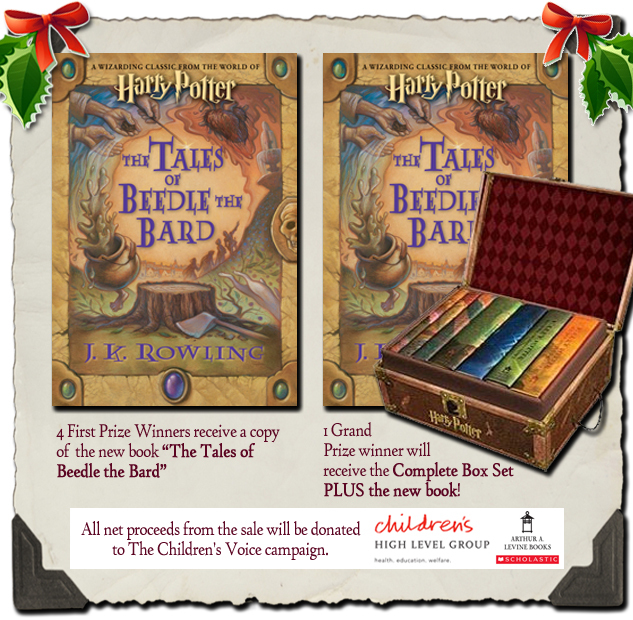 This purchase also represents another very important form of giving: From every sale of this book, Scholastic will give its net proceeds to The Children’s High Level Group, a charity co-founded in 2005 by J. K. Rowling and Emma Nicholson MEP to make life better for vulnerable children. You must be a Parenting Club Member to enter this contest. If you are not yet a member please register here. Membership is completely free! Please Note: If you already signed up for a Parenting Club account and can not login or signup for the contest, please make sure you have validated your account by clicking on the validation link in your welcome email. If you did not receive the welcome email, click here to resend. Also make sure cookies are enabled in your browser.